Life Balance and Health - Coaching and Leadership International Inc.
Life Balance can mean many things to different people. Working with thousands of people, we now know that people simply want to be healthy, happy and feel peaceful inside. It is that simple. A first step is to go to the link below and conduct this one hour profile of your life. 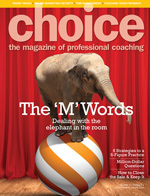 This link takes you to the Self Coaching Tools section of this site. Once you agree to the on-line license, click on "Happiness in 7 Areas of Life" and complete that profile. Then go to Choose Your CLI Power Coach� or Book a Power Coach now. Good luck and enjoy the results! "CLI has the best tools I've come across in the 25 years of my journey on personal growth and self awareness. I am extremely grateful for The CLI Program. These tools work for everyone and are so simple. What a gift for Brain Injured and us all. Thank you!!!"